We offer a large selection of premium quality Custom-Made Wooden Frames at great value for money. We have been in the Picture Framing & Photo Printing business for over 20 years in our Naas, Newbridge, Blackrock and Stillorgan Fujifilm stores. To meet the growing needs of our customers and our ever expanding framing business, we have now opened a custom framing store in Blessington. In addition to servicing the local community, it provides a framing service to our four Fujifilm stores. 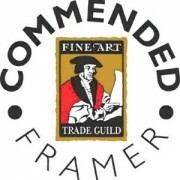 We are members of the Fine Art Trader Guild. Our experienced & professional staff are on hand to advise and assist you in framing your treasured moments and works of art. All our frames are made to order and we only use the highest quality wood mouldings.